With so many film premieres, the men were out representing on the red carpet over this last week. Here’s a look at what they’ve been wearing. Bradley Cooper: At the ‘A Star Is Born ‘premiere during the San Sebastian Film Festival in Spain on Saturday (September 29), Bradley was on his suave best in this navy Corneliani suit. Nicholas Hoult: The actor can work a patterned dress shirt like no other, and this orange-accented one definitely pumped up his blue Prada tailoring at the premiere of ‘The Favourite’ in New York City on Friday (September 28). Riz Ahmed: I will always love an aubergine suit, and Riz’s was an especially rich shade, with glossy Christian Louboutin loafers to polish it off at the premiere of ‘Venom’ in Westwood, California on Monday (October 1). Reid Scott: I’m not sure I feel quite as strongly about the electric-blue shade in a suit as I do in a gown, but this Strong Suit still made an impact at the ‘Venom’ premiere. Jon Hamm: Although this charcoal dunhill suit was pretty corporate, it was still a decent look for Jon at the Amazon Prime Video Europe Autumn Party on Tuesday (October 2) in London. 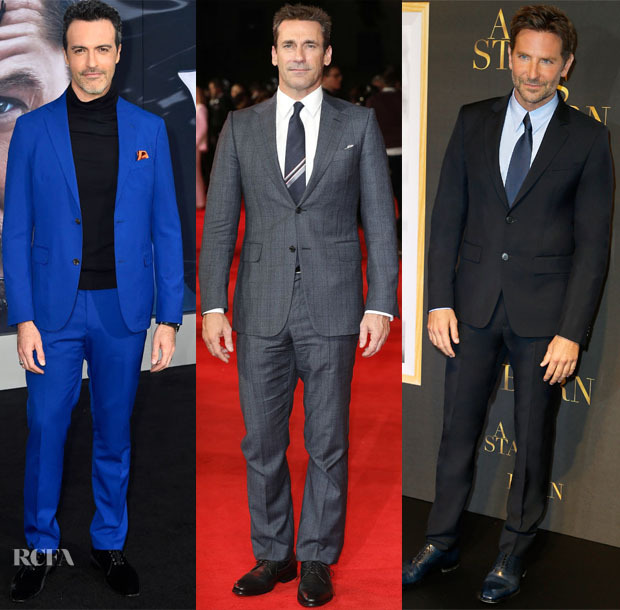 Bradley Cooper: For the Paris premiere of ‘A Star Is Born’ on Monday (October 1), Bradley kept the blue theme going in this Givenchy Fall 2018 midnight-blue suit and Christian Louboutin shoes. I don’t blame him for the colour consistency — these shades of blue certainly illuminate his eyes. Tom Hardy: Also at the ‘Venom’ premiere, Tom was perhaps the most formally dressed of the men in this three-piece, pinstripe suit. Rami Malek: Rami was also working the stripes — his, a bit more bold and modern — in this Dior Men ensemble at the Boston screening of ‘Bohemian Rhapsody’ on Monday (October 1). Jake Gyllenhaal: At the New York Film Festival ‘Wildlife’ premiere on Sunday (September 30), Jake also played up his baby blues in this polo shirt and suit combo from the dunhill label that offered a laid-back twist on tailoring.